That was a bit different! I had avoided Water for Elephants for a while because I hate circuses: I dislike the performances, don't like clowns and can't stand the idea of how the animals are trained and managed, even in the 21st century. But this turned out to be a worthwhile read. The main characters were very well developed and very likeable, and though it's all about the people of the circus, much of the action actually takes place outside of the Big Top. Yes, there's animal cruelty - it's about a traveling train circus from the Depression era. If I expect it exists in our enlightened and educated age, I am sure it was many times worse then. If it had been played down, it would have been unbelievable, and the reality of the story-telling did its job: to make the reader lose sympathy for certain characters to the point of hating them, as well as telling the reality of circus life. There were some very funny moments and some heartwarming ones. It's not a fast page-turner can't-put-it-down read but it's a good one. I also enjoyed the authors notes at the end, particularly the details of her research & that many of the small storylines were real events that she had discovered along the way. 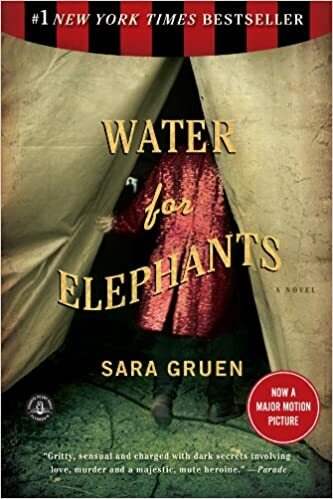 Sara Gruen is quite a vivid writer in that her small details managed to paint quite real and wonderful pictures. Not one for kids, a few brief R-rated moments. I liked it too. I was impressed with the character of the protagonist as a nursing home resident--well done, and by a woman, no less. It's not as easy as she makes it seem. Yes, he was a great character! Very believable. If you hadn't pointed that out, it wouldn't/ hadn't occurred to me that it was a woman writing that character and what a good job she did!